Moskowitz Bayse is pleased to announce Left to My Own Devices, a solo exhibition of new works by Los Angeles-based artist Valerie Green. This exhibition marks the artist’s first with the gallery. Through varied generative and self-reflexive studio-based processes, Valerie Green’s practice keenly explores the compression, expansion, and dimension of images in space. In Left to My Own Devices, she carefully considers the space of the digital screen by examining the interplay between the virtual and the tangible. 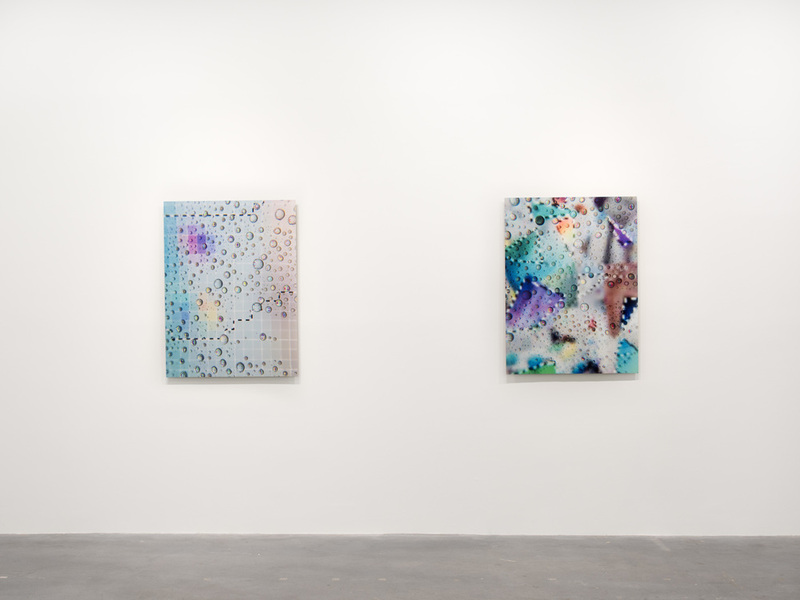 The first gallery features seven works, all of which are made by the artist directly photographing her computer, tablet, or smartphone screen. The screens digitally display layers of the artist’s own images, often re-photographed from physical prints. At stages throughout her cyclical process she sprays liquid screen cleaner onto the surface of any one of these devices; the drops, acting akin to a second lens, physically amplify and distort the pixels of the glowing image, creating vibrantly colored abstractions tensely held in space between the real and the virtual. Once these layers are flattened, they function as discrete, screen-like objects that create a reflexive tension between the object and the viewer. Works in the second gallery shift our attention to the screen as a physical material. Traditionally, screens have been used to delineate space for the purposes of ensuring privacy, protection, and pleasure in the home. Although these uses are seemingly different than our ubiquitous interactions with the glowing text and images of our devices, inherently they are quite similar. While acknowledging the weight of these complex definitions, Green playfully uses her own printed images to create “screens” in the studio. She perforates, tosses, peels, pins and then re-photographs the prints, creating fields of expansive trompe-l’oeil that seem to extend far beyond the boundary of each frame. Valerie Green (b.1981) lives and works in Los Angeles. She received her BA from University of California Los Angeles in 2006 and her MFA from California Institute of the Arts in 2011. Her work has been exhibited in solo and group exhibitions nationally, and was most recently included in Second Wave: Aesthetics of the 80s in Contemporary Art at the Culver Center for the Arts at UC Riverside and Second Sight: New Representations in Photography at the Torrance Art Museum.